Cork City Partnership wins national Q Mark Title » Comhar Chathair Chorcai Teo, Cork City Partnership Ltd.
It’s official! 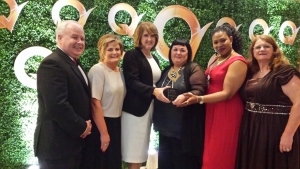 Cork City Partnership has just been named as having the Best Quality Management System in Public Service in Ireland at this year’s National Q Mark Awards. Hailed as “The Custodians of Business Excellence”, the team from Cork City Partnership were beaming with pride as they were called to the stage to receive the winner’s trophy during an exciting awards ceremony held in the Double Tree by Hilton Hotel in Dublin. The Q Mark Awards are indelibly associated with Quality and Excellence in the minds of Irish consumers and is the only system which allows businesses to monitor 100% of their processes and procedures 100% of the time. Winning this award has shown that Cork City Partnership truly cares about its customers and is willing to go the extra mile to ensure that it achieves the highest possible standards at all times. The Tánaiste and Minister for Social Protection, Joan Burton TD, who attended this year’s National Q Mark Awards, said “At the heart of our jobs plan we are supporting Irish businesses providing products and services to the highest international standards and creating good, sustainable employment. It is impressive to see tonight, so many Irish businesses from all sectors and counties embedding quality standards as a key part of their offering to customers. These are the innovative Irish businesses that are powering the engine of our recovery, and I wish them every success in the future”. Known as The Oscars of Business Excellence, The Q Mark Award is the highest accolade an Irish business can achieve, given both the intense competition and the exacting standards required. Cork City Partnership can now relax in the knowledge that they are officially the Best Public Service in Ireland for Quality Management Systems.